On September 27, 1947, at just past 2 o’clock in the morning, 28-year-old Officer Harris McCullough was responding to a disturbance call at the Pacific Electric Bus Depot along with his partner, Officer Frank Rogers. As the officers drove down Waterman and approached 4th Street, a young woman blew through the stop sign at 4th and broadsided the officers’ vehicle. The crash knocked the police car almost 80 feet off of the street and into a field on the southwest corner of the intersection, killing Officer Rogers almost instantly. The impact caused head trauma and major internal injuries to Officer McCullough, and he was transported to St. Bernardine Hospital in extremely critical condition. According to the local newspaper, many of Officer McCullough’s co-workers had volunteered to be typed for blood, as did officers from both Colton and Redlands Police Departments. 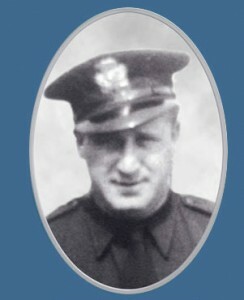 In the first hours as he struggled to survive, the paper reported that Officer McCullough was given a blood transfusion from fellow SBPD Officer Leonard Luce. After two days of struggling to survive, Officer McCullough succumbed to his injuries at 6 p.m. on September 29, making him the fourth police officer to die in the line of duty at the San Bernardino Police Department. Funeral services were held for Officers McCullough and Rogers at the Mark B. Shaw Memorial Chapel in San Bernardino on Thursday, October 2, 1947. Members of the San Bernardino Police and Fire Departments, as well as many officers from the City of Redlands and City of Colton Police Departments were in attendance. Both officers were buried at the Mountain View Cemetery in San Bernardino. Officer McCullough had been with the San Bernardino Police Department only two years when he was killed. He was born in Kalamazoo, Michigan, and had served in World War II. He had come to San Bernardino after being discharged from the military in 1945 and at the time of his death lived with his wife, Betty, and their young son, Thomas, at 252 E. Olive Street in the city.